Calxa provides powerful reporting features including the ability to bundle your monthly reports together and print or export them all at once. In order to deliver this feature you need to be able to save date criteria that will make sense, not just now and next month but next year or the year after. This knowledge base article explains the different date selection options available in Calxa and how you can use them to save you time each month. Each of the reports you deliver each month may have different date requirements. For example the start date of your report may always be the first month in the financial year or first month in the calendar year, but an ongoing project report may want the start date to never change, alternatively if you deliver reports that always cover the last 3 months then the start date will always need to cha change relative to the reporting month. As you can see there are many different possibilities and we haven’t even considered the end date. Calxa provides an easy way to save all of these combinations into your directly into your report criteria. Each month you simply select the reporting month and all your reports can be delivered based on that one simple selection. This knowledge base article should be used in conjunction with the following knowledge base articles - Running Reports and Using Report Bundles to Generate Batches of Reports. In the top left corner of both the Reports and Bundles screen you will see the Report Month. Many of the date selection option in each report are set relative to the Report Month. Therefore provided you have set the criteria correctly, each month when you run your reports this should be the only date you need to change. This applies equally to Reports and Bundles because Calxa remembers the previous criteria for standard reports as well. The Report Date selection option is used to set a date relative to the Report Month. 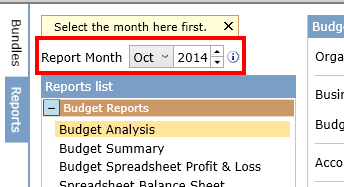 You can choose months plus or minus from the report month. Therefore each month when you change the Report Month the date used in your report criteria will also change. The Fixed Date selection is used to set a month and year that is independent of the Report Month. With this option the date used in your report criteria will not change when you change the Report Month. The FY Period selection option is used to specify a specific period in a financial year, where the year is determined by the Report Month. Therefore each month when you change the Report Month the month used in your report criteria will also change but the financial year will only change if the financial year of the Report Month also changes. Specify 1 for the first period in the financial year or 7 for the 7th period in the financial year. You can also specify negative values if you need periods in prior financial years or values greater than 12 if you need periods in future financial years. The Calendar Period selection option is used to specify a specific calendar month, where the year is determined by the Report Month. Therefore each month when you change the Report Month the month used in your report criteria will also change but the year will only change with the year of the Report Month. Specify 1 for January or 7 for July. You can also specify negative values if you need months in prior years or values greater than 12 if you need months in future years.